The din of the Lok Sabha elections is over, but the hill state that has been in the election mode for the past over two years due to repeated byelections, will continue in the same vein for some more months. The Congress may have lost three of the total four Lok Sabha seats in the state but it will still virtually have two representatives in Parliament. Virbhadra Singh today said the result of the Lok Sabha poll was more a reflection of the declining popularity graph of Chief Minister PK Dhumal than anything else. The sale of medicines, including life-saving drugs, at exorbitant rates has become a big scam as the difference between the cost price (CP) and maximum retail price (MRP) for various generic drugs ranges between 100 and 850 per cent. To defend the decision of setting up a cement plant near Sundernagar by the BJP government was one of the major factor due to which BJP candidate Maheshwar Singh was defeated by former Chief Minister Virbhadra Singh. The recent accident that killed two students of local Yadavindra Public School (YPS), Nitin (5) and Yash (7), on the Mandi-Padwahan road on May 9 has exposed the “private English-medium schools racket” being run allegedly under the nose of the Department of Education as most of these schools have no mandatory affiliation to the HP board or any central board like CBSE or ICSE. In a nightlong joint operation under Mandi SP Sonal Agnihotri, police today busted an inter-state gang of Rajpura-based five criminals after they were caught by two men and the police soon after they stabbed a car owner in their bid to steal the car. The HP High Court has observed that the recruitment and promotion rules have to be applied in a reasonable manner by taking into consideration practical ramifications thereof. Something that is impossible to be achieved cannot be insisted upon. Famous for its delicious apples, Himachal Pradesh itself is now flooded with imported varieties of the fruit. The state today witnessed a marginal increase in temperature in the absence of rain and snowfall. With the Dharampur assembly segment in the Hamirpur constituency fetching the highest lead among all assembly segments in the state for the ruling BJP in the just concluded parliamentary elections, former PWD minister and Dharampur MLA Mohinder Singh Thakur has justified his claim for the berth in the state cabinet. Narinder Thakur has congratulated UPA leaders for the magnificent show in the parliamentary elections. The State Bank of India (SBI) has announced to launch its services through post offices in Chamba district. The Tibetan Women Association (TWA) marked the 14 years of disappearance of Tibet’s 11th Panchen Lama here today. With no access to verifiable information, the concern about his safety has grown among the Tibetan community, they said. The police has registered an FIR against Billa of Bhaloon village and Atul, alias Vicky, of Jassur for allegedly outraging the modesty of a married woman yesterday. With two legislators, one each from the ruling BJP and the opposition Congress, getting elected to the Lok Sabha, the state will soon witness two more byelections. The Rohru assembly segment has fallen vacant with the election of former Chief Minister Virbhadra Singh to the Lok Sabha from the Mandi constituency. Similarly, former BJP minister and new MP from Kangra will make way for a new incumbent from the Jwali assembly seat. After the delimitation of constituencies, Rohru seat has been reserved for the Scheduled Castes and the boundaries of the Jwali segment have been altered and it has been re-christened as Fatehpur. However, the byelection will be held as per the shape and size of the constituencies existing in December, 2007, at the time of assembly elections. The LS election was held as per the new delimited constituencies, but the assembly constituencies will retain the present state for the current term and delimitation will come into force only during the 2012 elections. One of its leaders Chandresh Kumari, who represented the Kangra seat from 1984 to 1989, has been elected from the Jodhpur parliamentary constituency in Rajasthan. A daughter of Jodhpur Chandresh Kumari has been married into the erstwhile ruling family of Lambagaon in Kangra district. A convincing electoral victory in Jodhpur clearly indicates that the daughter had been well accepted by the people of her home state to which she returned after a gap of almost three decades. Having spent her lifetime in the hill state the local people and their concerns will remain close to her heart. Thereafter, she shifted to her home district Kangra and won from Thural in 1982 and remained minister of tourism for some time. She entered the Lok Sabha for the first time from the Kangra seat in 1984 and had a full term. Thereafter, she got elected to the Rajya Sabha. She was again elected to the state assembly in 2003, this time from the Dharamsala constituency, and became the health minister. However, her tenure as a minister turned out to be all too brief as she was dropped along two other ministers from Kangra during the exercise to downsize of ministry to bring it within the prescribed limits. She lost the assembly election in 2007. The opportunity to contest Lok Sabha poll from her native state could not have come her way at a better time and riding the Congress wave she had made most of it. Former Chief Minister and newly elected MP from Mandi Virbhadra Singh today said the result of the Lok Sabha poll was more a reflection of the declining popularity graph of Chief Minister PK Dhumal than anything else. Talking to mediapersons before leaving for Delhi, he said the popularity of Dhumal had nosedived and it was evident from the decline in the victory margin of his son Anurag Thakur from the Hamirpur constituency by over one lakh votes. The sharp reduction in the vote share of the BJP in the home district of Dhumal was a severe indictment of the functioning of his government, he added. They were virtually coerced to vote for the ruling party. Still the voters turned out against him in strength, which gave ample indications of the emerging political scenario in the state, he said. As far as the Congress was concerned, it lost two seats with a slender margin, which it could have won with a better organised and more aggressive campaigning. The party leaders who campaigned in the Shimla constituency put up their best efforts as per their calibre, but that was not enough. Replying to a question, he said PCC chief Kaul Singh could not be blamed alone for the unsatisfactory performance of the party as he did not enjoy a free hand. He said joining the national politics did not mean that he would be cut off from the state. He would remain in touch, he asserted. Replying to another query, he said it was the prerogative of the prime minister and the party high command to include anyone in the ministry. He firmly believed that a Member of Parliament had more potential than a minister when it came to serving the people. As the Centre and the state governments have become mute spectators to the whole episode, the people are being fleeced by medical companies and retailers. Despite the fact that the Essential Commodities Price Control Act is applicable in many states in the country, which also covers the sale of drugs, no action has been initiated against erring companies by any state so far. The Union Ministry of Chemicals has assured consumers on a number of occasions that it will come out with a policy fixing the margin of profit for retailers and wholesalers, but nothing has been done till date. The Tribune conducted a survey in this regard and met over 50 dealers of medicines and collected wholesale and retail prices of various drugs being manufactured by various companies under the RTI Act. The survey revealed that the chemists had been charging MRP from the consumers, which was fixed very high in most of the cases. The survey shattered the general impression among consumers that the margin of profit in case of drugs prepared by renowned companies was restricted only between 10 and 20 per cent. In fact, the margin of profit in case of these medicines went up to 850 per cent. Various documents substantiating these claims are in the possession of The Tribune. An officer of the Health Department said the MRP was always fixed by drug companies themselves and the states had no control over it. It may be recalled that there were over 100 drug manufacturing units of standard companies in the state supplying drugs all over India, but the state government is ignorant about the margin of profit being charged by them. One wonders if these companies are allowing retailers to earn around 800 per cent profit, what will be the manufacturing cost of these drugs? 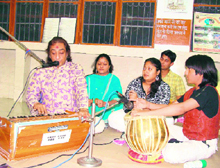 The Nagbhram Sangeet Ashram and Research Academy, Mumbai, is likely to open a deemed music university at Kangra in order to rejuvenate the traditional classical music among younger generation and to make classical music job-oriented. Disclosing this here today in a press conference at the Sadashiv Mandir Sidhyog Ashram, Pandit Anupam Rai, director of the Sangeetanjali Nagbhram Sangeet Ashram and Research Academy, Mumbai, and a renowned master of classical music, said sharp voice was a divine blessing of god. He said the proposed university would help talented youths of the country to channelise their inherent talent in right perspective. He said music was a spiritual art and needs spiritual environment and ‘Dev Bhoomi’ was having the ideal environment. Rai said the FORD Foundation of the United States was ready to extend financial help for this university and hoped that the Government of India would help in order to strengthen the move to preserve the Indian cultural heritage through music. He said classical music does not mean what bores people, but a process through which divine peace could be attained. It is an expression of one’s devotional feelings towards god, he added. He said the university would provide job-oriented music education to the youth, however, it would not be a vocational institute. He said if the state government comes forward and provides adequate land for this university and people show inclination, then it would be set up at Kangra by the end of this year. Pandit Anupam Rai is a recipient of many awards and is a disciple of Mahaprabhu Shri Ram Lal Ji Maharaj and Yogeshwar Chander Mohan Ji Maharaj whose ashram Sadashiv Mandir Sidhyog Ashram here works for the promotion of yoga and music. Swami Vijay Puri Ji of the Sadashiv Mandir Sidhyog Ashram was also present at the press conference. Anupam Rai and his daughter Anurita Rai presented some devotional classical songs and left the audience spellbound. The BJP government has been trying hard to set up the plant near Sundernagar despite stiff opposition from local residents. Various social organisations and political parties, including the Congress and the CPM-CPI, have been demanding shifting of the plant to a far off area, but the BJP instead of shifting has speed up the work of setting it up. On one hand it issued notifications of two sites for land acquisition and on the other it allowed the cement company to purchase land directly from farmers. In the two assembly segments of Sundernagar and Nachan, which fall under Sundernagar subdivison, the BJP has gone down by nearly 13,000 votes, which was the margin of victory. However, if the votes polled to other candidates were counted the margin of anti-BJP votes come to around 17,000 in these two assembly segments. These two assembly segments have been the traditional seats of the BJP as Roop Singh Thakur is representing Sundernagar as its MLA for the sixth time and senior BJP leader Dile Ram is representing the Nachan assembly segment for the fourth time, but both leaders did not want to listen a word against the cement company. According to them, the plant would give prosperity in the area through employment. During the present LS election when Virbhadra Singh toured various areas and interacted with farmers he promised that if voted to power he would get the plant site shifted and on the other hand Maheshwar Singh was opposing the decision of the Ski Village at Manali, but was favouring the cement plant at Sundernagar. According to spokesman of the Sundernagar Sangharsh Samiti Lawan Thakur, local Congressmen have not made it a poll issue. Had it been so, the lead of victory of Virbhadra would have been on the higher side. On the other hand, general secretary of the Bharatiya Kishan Sangh Joginder Singh said the double standard of the BJP with regard to setting up various projects forced the public to be against its candidate. These English-medium private schools are being run in Mandi, Sarkaghat, Sundernagar, Ner Chowk, Jogindernagar, Gohar, Karsog, Khanag (Ani), Kullu, Banjar, Manali and most of the small towns in the state. As the government schools offer no English-medium education, these non-affiliated private schools rope in students from the richer sections of society, who are crazy to enrol their children in the English-medium schools. They plead innocence about board affiliation. In the recent case, the YPS chain of schools, which came to light after two children were killed in the road accident here, runs 16 such schools in the Mandi region, but these schools have no affiliation to any board, charged parents, who came to know about it recently. “These schools have now admitted students up to class VII, but have no affiliation to any board,” they added. The Tribune investigation revealed that YPS chain of schools is not the only chain which is being run without any affiliation to any school education board in the state. There are countless such private English-medium schools doing brisk business in small towns all over the state, investigation revealed. “They enrol students in lower classes and then enter them as private candidates to appear in higher board examinations,” revealed sources. Some of the schools owners claimed that they have applied for CBSE or ICSE or state board affiliation, the sources revealed. These schools are not only minting money, but are also jeopardising career of innocent children in these towns, cautioned educationists. “These schools are flourishing as the craze for English-medium schools is rocketing in smaller towns because the government schools have no English-medium and also no teachers to fill in the demand,” they pointed out. Col J Kumar (retd), who runs the YPS chain of schools, admitted that they might have no affiliation to any board, but they are giving quality education to children and teaching the CBSE pattern in all schools. “Affiliation is a slow process,” he added. HP board officials put the blame on the Education Department as the board conducts examinations and affiliation and regulation of private schools is looked after by the Education Department. Director of the Elementary Education Sunil Chaudhary, however, said the department would take action if the private schools are being run without any affiliation. According to the police, the five criminals struck in the late night hours and allegedly took the car (CH-03R 5214) of Kishan Chand, a resident of Randhara on the Mandi-Rewalsar road, to gurdwara at 2 am. Then they stabbed him on the back with a knife after he refused to hand over the keys to them. Before they could escape with the car, Chand raised an alarm at which Ramesh and Hem Chand rushed from nearby houses to his rescue and took on them. They stabbed Ramesh also, but Hem Chand got hold of Satnam, but Depty Singh, Pawan Kumar, Jadeep and Balvinder escaped under the cover of darkness. They all come from Rajpura and have been arrested under Sections 382, 307 of the IPC. Hem Chand said they appeared to be dreaded criminals as they had sharp weapons, including pistols. They stabbed Ramesh and Kishan on back and took out country made pistol to decamp with the car, but other villagers and policemen rushed in and they disappeared into the jungle. Panchayat pradhan Ratned Randhara Sita Devi said they along with the police zeroed in on the scene and laid traps on the escape route. “We hunted for them throughout the night before they hit the road head, near Rewalsar, in the morning where they were caught,” she added. The victims were rushed to zonal hospital, Mandi, where they were reported stable and out of danger and have been referred to IGMC, Shimla, for further treatment. Mandi ASP Madan Lal said they were wanted in a car lifting case at Shimla about 15 days ago. Satnam had eight cases pending in Rajpura, Balvinder 10 cases pending in Ludhiana and other places. Balvinder operates anther gang while Pawan and Jagdeep have joined the gang recently, he added. The court made this observation on a petition filed by a motor mechanic with the state Public Works Department, wherein he sought higher pay scales as per the government notification. The state contended before the court that since the petitioner had not obtained a two-year technical training from an Industrial Training Institute, he was not entitled to the higher pay scale on the basis of the government notification. The petitioner alleged that he could not be declared ineligible for the higher pay scale only on the ground that he was not having technical training of two years. The condition of obtaining the two-year diploma course could not be imposed upon the petitioner since he had already passed diploma course of a one-year duration before his appointment from the recognised institute. While allowing the petition, the court directed the state to release the higher pay scale to the petitioner from 1976 with 9 per cent interest and also observed that the state was required to look into the matter rationally. The court declared that the action of the state department to deny the petitioner higher pay scale was arbitrary. The court observed that the authority should have applied common sense view instead of taking a decision that resulted in denying higher pay scale to petitioner. Chinese and Australian apples, known for their natural sweetness, colour and succulence, are selling well in the state, often referred to as India’s “fruit bowl”. “The demand for imported apples is quite good as the local varieties are yet to hit the markets,” said Jagdish Gupta, a wholesale fruit seller at Sanjauli, near here. “Every day, we sell 30-40 cartons, each 25 kg, of Chinese and Australian apples. Buyers are mostly hoteliers and caterers. We get the Chinese apples from the Delhi and Chandigarh markets,” Gupta said. Subhash Gupta, another seller, said the price of the Chinese Red Fuji variety and Australian Granny Smith at the Sanjauli wholesale fruit market ranged between Rs 3,000 and Rs 3,500 per 25-kg box. “With the arrival of the apple crop from the hills by July, demand for the Chinese ones will reduce drastically,” Subhash Gupta added. The Red Fuji variety starts arriving in India at the beginning of April, and is available till November end. “Sellers prefer it because of its 10-month-long shelf life,” said SP Bhardwaj, joint director at Solan-based Dr YS Parmar University of Horticulture and Forestry. “There are reports of some damage to fruit crop in the mid-hills (up to 6,500 feet) due to abrupt fall in temperature, but it is not to a large extent. Only old plantations were affected in some areas,” Bhardwaj said. Harvesting will begin in July and continue till October. Himachal is one of India’s major apple-producing regions, with more than 2,00,000 families engaged in the cultivation of the fruit. The state had produced 25.5 million crates of apples in 2007-08, though the maximum output of 28.6 million crates was recorded in 2006-07. Besides apples, other fruits like cherries, pears, peaches, apricots, kiwi, strawberry, olive, almonds and plums are the major commercial crops of the state. The minimum temperature in Shimla settled at 17.9°C, one degree more than yesterday’s 16.7°C. Elsewhere also, the temperature hovered above normal. While Sundernagar registered minimum temperature of 19°C, it was 19.3°C in Dharamsala. Una recorded the minimum of 17°C, Mandi’s temperature settled at 20.1°C, the Met office said, adding that mercury at Nahan hovered around 25°C. In the high reaches, Kalpa in Kinnaur district recorded the minimum temperature of 6°C, the Weathermen said. The Dharampur assembly segment, which was included in the Hamirpur parliamentary constituency after carving it out from the Mandi parliament constituency, had contributed the highest lead of 14,864 votes in the victory of Anurag Thakur. Chief Minister Prem Kumar Dhumal had been proclaiming from public platforms that the performance of MLAs, ministers and party leaders would be adjudged on the basis of performance of candidates in their areas of influence during the election. Dhumal had said that the performance of party leaders would be reflected in the party organisation and government and those performing well would be rewarded. Since two more ministers could be accommodated in the cabinet, the areas having no representation or lesser representation would be accommodated at appropriate time, he had said. There have been talks of including a minister each from Mandi and Una districts since there is only one minister, Gulab Singh Thakur, from Mandi despite having 10 MLAs in the assembly, while Una district has not found any representation till now. In this context, claims of Mohinder Singh Thakur from Mandi and Sat Pal Satti from Una, from where the candidate has got lead of 7,828 votes, have been vindicated. Mohinder Singh Thakur had also played a significant role in the formation of the BJP-HVC combine government in the state in 1998 when PK Dhumal was installed the Chief Minister for the first time. He also ensured the highest margin of 20,000 votes in the state for the BJP-HVC alliance candidate in the 1999 parliamentary elections. He thanked the people of Hamirpur district for their support in the elections. He also thanked party workers for working day and night for the party. The SBI organised a seminar in collaboration with the Department of Posts here recently. It was attended by post office officials in the district and SBI personnel. Inaugurating the seminar, chief manager of the State Bank of India, Chamba, TD Negi said the bank would act as a ‘business facilitator’ in post offices and provide its banking services to the people residing in far-flung areas of the district. Staff of local post offices would be employed on commission basis for extending bank services to customers. He called upon postal staff to bring clusters of villages under SBI banking schemes so as to help improve socio-economic conditions of the rural masses. Gedhun Choekyi Nyima, the then six-year-old boy from Nagchu district in Tibet, was identified by the Dalai Lama as the 11th Panchen Lama of Tibet on January 25, 1995. Since then, he has gone missing. The Tibetans are alleging that he is under detention of the Chinese authorities. “The continued detention of Gedhun Choekyi Nyima and his parents illustrate a serious case of political oppression, social suppression and religious repression in Tibet. It is also a blatant rejection of the recommendations of the international human rights bodies by the Chinese authorities,” they said. The TWA also convened a panel discussion on the issue. The aim was to decide on the best course of action to secure the release of the imprisoned Panchen Lama, a spokesperson of the association said. The woman, who belonged to Bhaloon village, said she was alone at her house when the accused came and told her that they brought her drunken husband in a vehicle. They pushed her into the vehicle forcibly and outraged her modesty. Later, they left her at Jassur and fled away, she alleged. Later, she and her husband Monu Singh reported the matter to the police. According to DSP Hari Ram, a case has been registered under Sections 354, 342 and 34 of the IPC. The accused would be arrested soon, he said.